The Wetskills Water Challenge will be organized for the 2nd time in Israel. Wetskills is a two-week event for university level students & young water professionals from around the globe. Participants work in multidisciplinary & intercultural teams to develop out-of-the-box solutions for local water challenges, posed by Case Owners. This Wetskills event will contain 17 participants from various Israeli and Dutch universities, related to water. In total four cases will be elaborated, amongst them from Mekorot & Netafim. Wetskills will formally start on Sep 3, 2017 with two days of team building in & outside Haifa & Lake Kinnereth to water-related & cultural sites. On Sep 5 an opening event will take place, hosted by GWRI, Technion & Kinnereth College. On this day, called BrainHurricane, case owners present their challenge to the student teams & various experts will advise the teams in speed date sessions. Over the next 9 days the participants’ teams will work on the challenge with periodic guidance of Dutch & Israeli supervisors, & support from diverse local experts from academia, companies & governmental institutes. 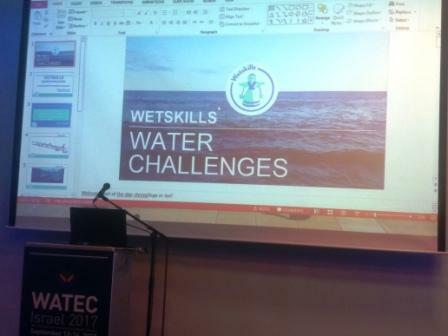 Each team will present its solution at the end of the (two-week) challenge during a special pitch session as part of the program of the WATEC Israel 2017. Since 2010, more than 500 students & young professionals from about 100 international universities & organizations have participated in one of the 25 Wetskills Water Challenges organized in Asia (China, Taiwan, Indonesia & India), North Africa & Middle East (Israel, Oman, Morocco, Iran & Egypt), Sub-Saharan Africa (South Africa & Mozambique), Europe (United Kingdom, Romania & the Netherlands) & North America (United States & Canada).